Indiana has become a magnet for factory farms. Despite the growing demand for food produced locally and in a sustainable way, the Indiana Department of Agriculture has embraced factory farming as the way of the future. 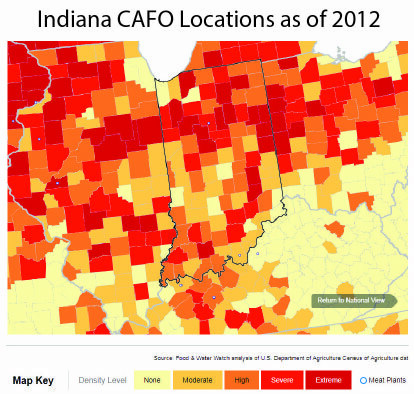 More than half of Indiana’s 92 counties are home to at least one factory farm. Concerned citizens in those communities have organized to protect their property values, public health, the environment, and quality of life, but face an uphill battle. Oversight and inspections from the Indiana Department of Environmental Management are lax and infrequent. State law fails to protect the neighbors of these industrial farming facilities and the streams and public lands they often pollute. Some county officials have exercised home rule and denied the necessary permits, only to be threatened by the state for not going along with the program. Animals in these confined feeding operations are often over-treated with antibiotics – not to treat an illness but to keep them from getting sick because of their filthy, over-crowded and stressful living environments. In fact, 70% of all antibiotics are used on livestock. This routine use has led to antibiotic resistance bacteria, making food borne illnesses more dangerous and difficult to treat. Citizens across Indiana, in both urban and rural areas, must come together and work for new laws that will provide for stronger regulation of factory farming, stop the over-use of antibiotics in farming and promote agriculture practices that are sustainable and meet the growing demand for safe, local food. The Citizens Action Coalition Education Fund has launched the Downstream Project to educate Hoosiers about the negative impact of factory farms and to build a strong statewide coalition of consumers, food producers, food business owners and others who will work together to strengthen state regulation of industrial agriculture and promote policies that embrace a sustainable food system. Together, we can demand a food production system that is safe and sustainable and that brings real economic opportunities for small business people and workers across the state. For more information on Downstream Project, please contact Project Director Julia Vaughn at jvaughn@cacefindiana.org or 317-432-3264.